After having lunch in one of the restaurants at Rockwell Power Plant Mall last Saturday, hubby went looking for something sweet to eat. He was actually enticed by the long line of pastries/desserts spread out along the concourse level of Rockwell Power Plant Mall. He bought a box of 12 mini cupcakes from Costa Brava for Php200.00, quite expensive, I must say, for the size of these cupcakes. After trying out the cupcakes, however, I realized that the price was just right for the creamy goodness and delicious taste of these mini cupcakes. 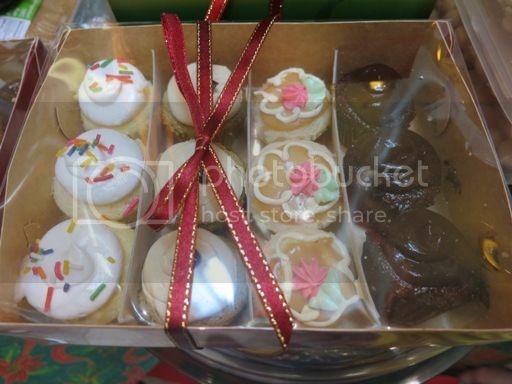 According to the seller, what they have in this box are their bestsellers, namely: white marshmallow, mocha, caramel and chocolate. All four of us (three adults and a child) agreed on the following points about the cupcakes: they’re soft, moist and rich but not overwhelmingly sweet. Next time, we’ll buy the regular-sized cupcakes which cost Php250.00 (6 pieces).